I have a love of color... and colorful creatures. When the new Perfect Peacock stamp came out then the new Blendabilites Markers... I knew that I was IN LOVE!! Color me happy - this card came out better than I imagined! You, too, can create a colorful work of art that will celebrate that special person in your life, just like this hand-stamped card. Ohhh the joy of the Blendabilites Markers and this Perfect Peacock stamp!! 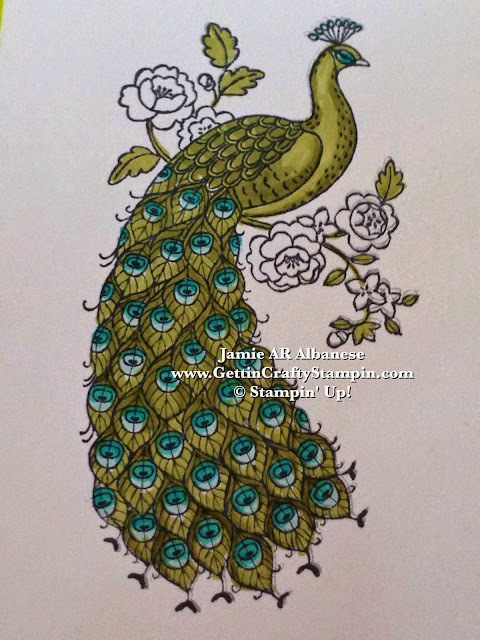 Stamping the Perfect Peacock stamp with the Memento ink pad (a must in order to use the Blendabilites markers) on this Whisper White card stock gives me a stunning image! Starting with the Costa Cabana Blendabilites I did a Ombre technique. 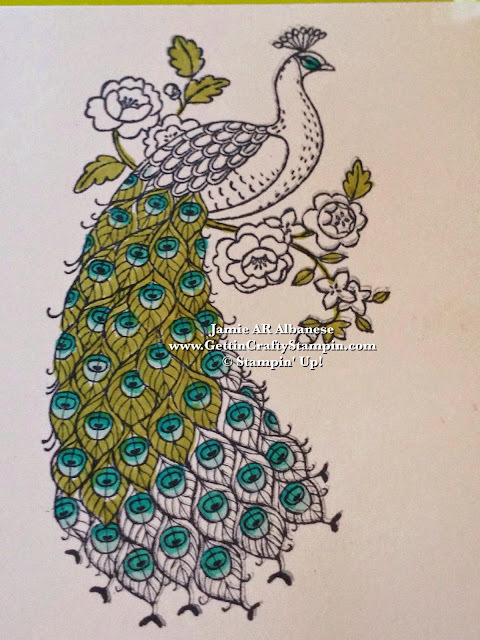 Color the lightest of the trip of markers on the eye of the feathers. Color 1/2 way down each 'eye' with the Medium of the collection then the base of each 'eye' with the dark (the least used of the trios). Do the same with the Old Olive on the Perfect Peacock - starting with the Lightest across the majority of the feathers/bird. Add the Medium 1/2 way down the feathers. Tip and shadow the bottom of each feather with the Darkest of the trio. Oh - I'm soooo Happy!! I ADORE all the COLOR!! 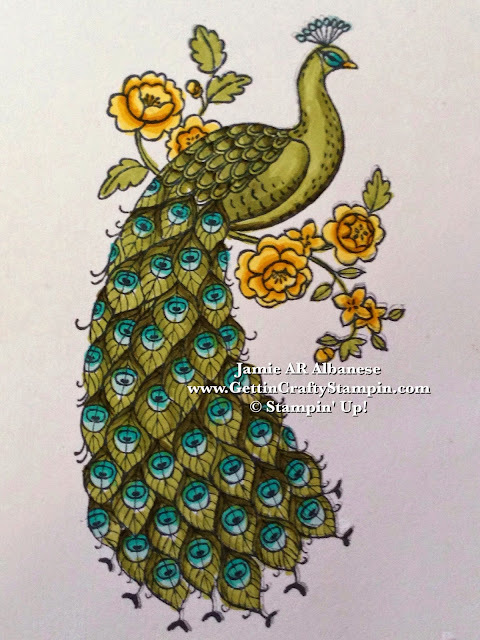 Adding dimension and the Ombre look is easy on the body of the Peacock, as well. I actually decorate and have real peacock feathers in my home and on my inspiration wall. I looked for the colors used by God for this card (it's so awesome to find inspiration in nature!!). Creating a similar look with the coloring of the flowers for additional depth and beauty. This method of Ombre coloring using the Blendabilites is quick, easy and fun! I LOVE this stamp and these markers... color me ecstatic!! Ombre color the eyes and beak, too, for a fun and elegant look. 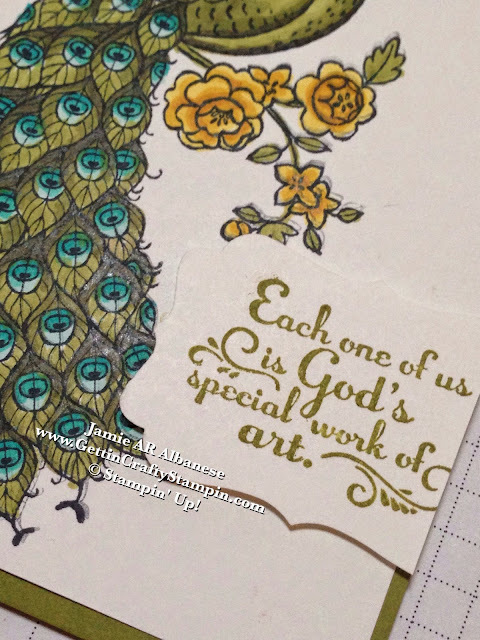 Stamping this Trust God stamp set 'Each one of us is God's special work of art.' This perfectly ties into this stunning stamp set, is an ideal way to bless someone who is struggling or just-because. Stamping it on the Whisper White and using the Decorative Label Punch it will be a subtle mimicking of the lines in the greeting and peacock. 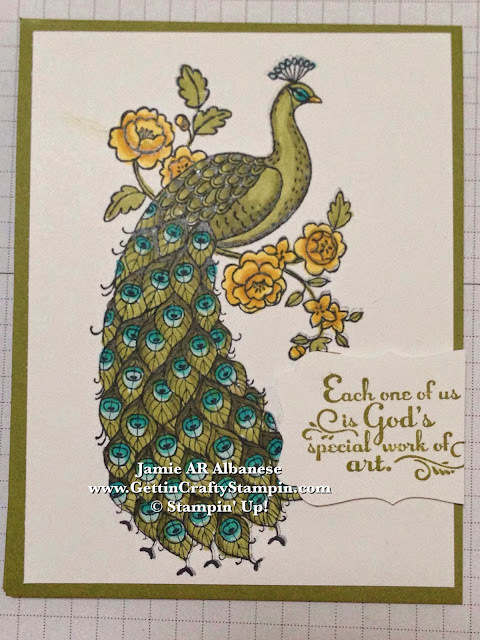 Place it with the Stampin' Dimensional Adhesive for additional depth. Layer it all over a perfectly color coordinated Old Olive card for an elegant and easy hand-stamped card. Celebrate those who bring color and beauty into your life. 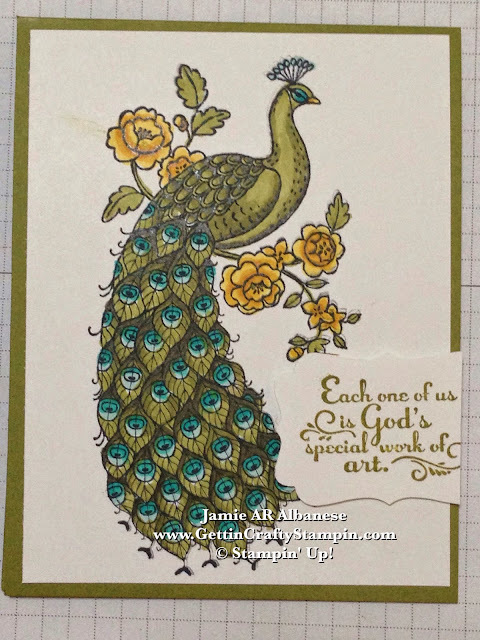 This hand-stamped, Blendabilites Marker Colored, Perfect Peacock card does all that and more! Using an Ombre technique to add color, depth and dimension to this stunning card is a fun and easy way to delight and wow! How do YOU use your Blendabilites? Leave me a comment and let me know.